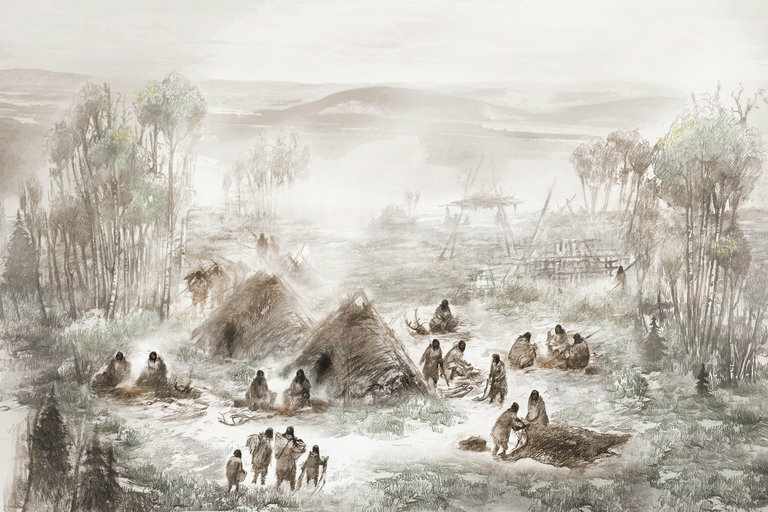 W	W	hen scientists recently sequenced the genome of a six-week-old infant girl who lived 11,500 years ago at an Alaskan site now called Upward Sun River (USR), they expected that her DNA would match the genetic profile of other northern Native American people. Instead, the genome of the infant — named Xach'itee'aanenh T'eede Gaay, meaning "Sunrise Girl-Child" and called USR1 by scientists — matched no other known ancient population. "It was very surprising to find that USR1 belonged to a Native American population that was actually distinct from the two main Native American branches to which all Native American genomes sequenced to date belong to," J. Víctor Moreno-Mayar of the University of Copenhagen Center for GeoGenetics told Seeker. "This means that this population was living up there, isolated from other Native American groups, for a considerably long time," he added. Moreno-Mayar and his colleagues' findings, published in the journal Nature, support what is known as the Beringian Standstill Hypothesis. The theory holds that while all Native American ancestry can be traced back to a single East Asian source population, some descendants of this group migrated to eastern Beringia — what is now Alaska — and lived there for thousands of years. The new paper further shows that eastern Beringia remained inhabited even after a separate branch of Native Americans had already been established in unglaciated North America. Sunrise Girl-Child was one such early Alaskan. Her remains were found, along with those of another younger female infant named Yelkaanenh T'eede Gaay, meaning "Dawn Twilight Girl-Child," during a 2015 excavation of USR in Interior Alaska, the central region of Alaska's territory. The excavations were enabled by an agreement signed, in part, by the Healy Lake Tribal Council and the Tanana Chiefs Conference, which is the traditional tribal consortium of the 42 villages of Interior Alaska. Just 200 years before the young girls' short lifetimes, the last glacial period of the Pleistocene Epoch (2.6 million–11,700 years ago) ended. A popular hypothesis known as the Bering Land Bridge Theory, first proposed in 1590 by the Spanish missionary Fray Jose de Acosta, posits that during the Pleistocene, Beringia was a vast super-continent that extended from Siberia to what is now the Yukon territory of Canada. The western and eastern portions of Beringia were joined by the Bering Land Bridge that was dissected at times by several rivers. Geological evidence suggests that waters receded during the Late Pleistocene, better exposing the land bridge and easing navigation over it. Animals, including humans, could likely just walk over the natural bridge until about 10,500 years ago, when waters of the Bering Strait and the Chukchi Sea covered it. Sunrise Girl-Child, Dawn Twilight Girl-Child, and their families stayed in Beringia, so the researchers have decided to call the population that these early people represent the Ancient Beringians. 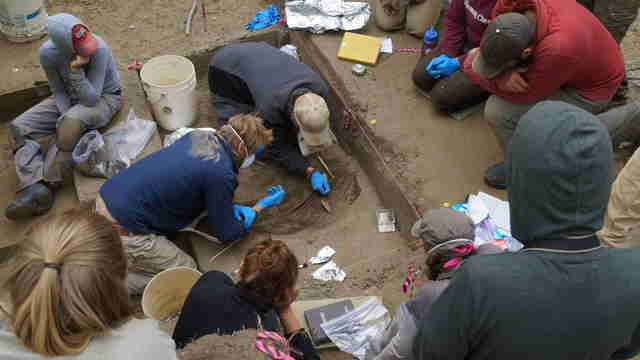 "From archaeological data, we can say that the Ancient Beringians were likely present in Alaska from at least 12,500 to 6,000 years ago," co-lead author Ben Potter, a professor of anthropology at the University of Alaska Fairbanks, told Seeker. "Interestingly," he added, "the tools associated with this group, including microblades, are very similar and historically related to the widespread microblade-using cultures in Northeast Asia, found in Japan, Korea, northern China and Siberia." The genetic data shows that the two infants were probably first cousins. The DNA samples of Dawn Twilight Girl-Child were not sufficient for extensive further analysis, however, so the researchers instead focused on Sunrise Girl-Child. Moreno-Mayar, senior author Eske Willerslev and their team compared Sunrise Girl-Child's genome sequence to a set of both ancient and contemporary genomes. 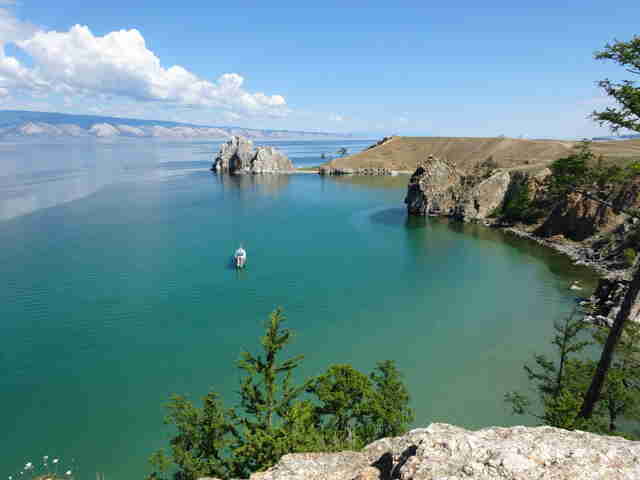 The comparison suggests that the ancestors of Ancient Beringians and those of other Native Americans descended from a single founding population that first split from East Asians around 36,000 years ago, although gene flow with North Eurasians — possibly centered around Lake Baikal in southern Siberia — continued until about 25,000 years ago. The founding population then split into two groups approximately 20,000 years ago, the genetic evidence suggests. According to the researchers, these groups were the newly identified Ancient Beringians and the ancestors of all other Native Americans. There are two possible explanations for where this split occurred, and how the separation affected subsequent migrations. The first possible scenario is that Ancient Beringians and the ancestors of other Native Americans diverged somewhere in Asia 20,000 years ago. Both populations then could have moved along different routes, or at different times, through Beringia. The second possible scenario is that Ancient Beringians and the ancestors of other Native Americans diverged in what is now Alaska 20,000 years ago. The latter group then could have moved south of the ice sheets at a later date. "Regardless of whether scenario one or two is correct, there was a single population of ancestral Native Americans, and they at least migrated to an area where they were genetically isolated from ancestral East Asians and ancestral North Eurasians," Potter said. Moreno-Mayar noted, "By 20,000 years ago, most of North America was covered by two vast glaciers, so whenever Native Americans made it to Alaska, they most likely still had to wait until a viable route into mid-latitude America was made available." As for why people then migrated so much, prior research suggests at least one reason. They appear to have been following the movements of prey animals. These could have included migrating schools of fish and/or terrestrial mammals such as woolly mammoths, steppe bison, and caribou. Geological and ecological evidence suggests that the northwest American coastal route was ice-free and potentially navigable by 16,000 years ago, while the American interior was ice-free by 15,000–14,000 years ago. A debate now exists as to precisely when humans first colonized the Americas and if those first routes were over land or water. Moreno-Mayar and his team admit that the genetic evidence cannot yet provide definitive answers to these questions. Archaeological findings ranging from everything to an ancient fishhook to fossilized excrement provide clues, though. Evidence for human settlements at Triquet Island, Paisley Caves, and the Channel Islands along the western North American coast all date to around 13,000–14,000 years ago. The sites Quebrada Jaguay, Quebrada Tacahuay, Quebrada Santa Julia, and Monte Verde along the western South American coast date to about 13,000 years ago. On the eastern coast of North America, the site Page-Ladson in Florida dates to approximately 14,500 years ago. Stone tools and mastodon remains suggest that humans there were hunting big game. Yet another early site is Huaca Prieta, north of Peru, which dates to 15,000–14,500 years ago. Taken together, the genetic and archaeological evidence then suggests that people first expanded out of Beringia by about 16,000 years ago. 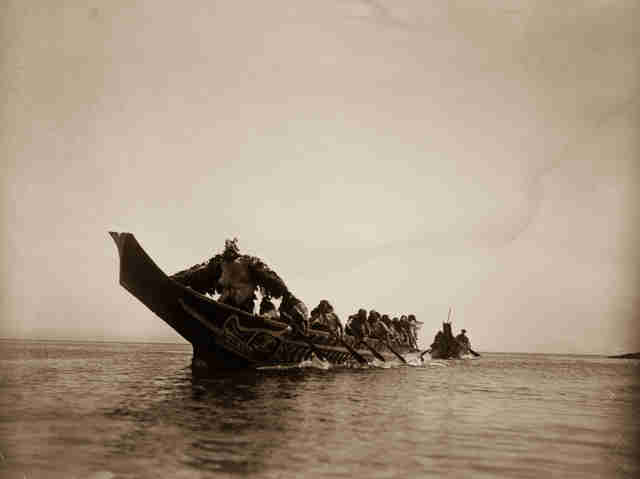 Archaeologist Todd Braje of San Diego State University, who recently co-authored a paper published in Science on Native Americans, told Seeker that "the first Americans likely arrived along the Pacific Coast — not crossing the open Pacific but migrating along the Pacific Rim in boats in a step-wise fashion." Michael Waters of Texas A&M University also favors the over water migration theory. "The only logical way people could have come to Florida by 14,600 years ago is if their ancestors entered the Americas by boat along the Pacific Coast," Waters told Seeker. "They could have traveled by boat to central Mexico, crossed and come along the Gulf Coast. They could have entered the Americas via the Columbia River and then traveled inland to the Mississippi River and followed it down and entered the Gulf Coast, eventually making their way to Florida." Whether or not the first continental Americans arrived in such a way, or by crossing the Bering Land Bridge, remains a mystery for now. Even more puzzling is the controversial 130,000-year-old Cerutti Mastodon site in coastal San Diego County, California. Its discovery was announced in an April 2017 paper published in Nature. Lead author Steven Holen of the Center for American Paleolithic Research and his team reported finding "hammerstones and stone anvils" along with "spiral-fractured bone and molar fragments" of a mastodon that they believe was butchered. "We don’t know how this animal died, " University of Michigan paleontologist Daniel Fisher, a co-author of the paper on the Cerutti Mastodon site, remarked to Seeker. "We don’t know whether humans were part of that death. All that we know is that humans came along some time after the death, and they very strategically set up a process involving the harvesting of marrow from the long bones and the recovery of dense fragments of bone that they could use as raw material for producing tools." Such an early settlement of the Americas is not at present widely supported by other scientists. If additional evidence is found to support the claims, however, this could mean that anatomically modern humans were not the first members of the genus Homo to arrive in the New World. Moreno-Mayar and his team did find that Sunrise Girl-Child/USR1's genome contained Neanderthal DNA. All people of Native American heritage also retain Neanderthal DNA. "Interestingly, we found that USR1 carries a slight excess of Denisovan ancestry compared to some Native American groups," Moreno-Mayar said. Future investigations may shed light on what this means, along with what ultimately happened to the Ancient Beringians. So far, the DNA results, along with other archaeological data, suggest that Native Americans who initially migrated south moved north again approximately 6,000 years ago. The researchers suspect that this population eventually absorbed or replaced the Ancient Beringians. Nevertheless, the Ancient Beringians now have a branch on the family tree showing the origins of all Native American populations.